Urine is the nitrogenous liquid form of waste that is excreted from the body with the help of kidneys through the process of urination. Filtrate is the liquid that is formed in the kidneys while urine formation is taking place. Water is the major component of urine, forming about 95% of it while the remaining part is formed by other organic and inroganic constituents. The other constituents that form urine in descending concentration are as follows urea 9.3 g/L, chloride 1.87 g/L, sodium 1.17 g/L, potassium 0.750 g/L, creatinine 0.670 g/L and in small concentrations urine also contains some ions, organic and inorganic compounds. Glomerular filtrate is the same as plasma of blood, the only difference being that it does not contain blood cells. It contains proteins, glucose, creatinine, urea, uric acid and various ions such as Na+, K+, Cl-, and HCO-. Urine formation takes place in 3 steps namely, filtration, reabsorption and secretion in the kidney. Kidneys contain nephrons which act like filters for blood and separate the waste from it to form urine. At the beginning of each nephron, is a network of capillaries known as renal glomerulus which is surrounded by Bowman’s capsule, this is the first step of filtration. The glomerulus receives blood from an artery and exits it via another artery. This passing blood is filtered through the glomerular membrane and enters a collecting cup called the renal tubule. This fluid leaving the glomerular membrane is known as glomerular filtrate. The rate at which the filtrate is formed is about 125 ml/minute but only 1.5- 1.8 litres of urine is excreted from our body under normal circumstances. After leaving the Bowman’s capsule the filtrate goes into the renal tubules where 99% of water, all of glucose and amino acids, most of the Na and Cl ions are reabsorbed back into the blood. As the fluid passes further, more constituents are reabsorbed and finally, urine is formed which is excreted from the body. The rate at which the blood is filtered in all the glomeruli is known as glomerular filtration rate (GFR) and it gives us the information about the overall health of kidneys. GFR is altered in case of kidney diseases and hence can be used to assess the damage caused to kidneys due to those diseases. GFR test is done in people suffering from diabetes, hypertension, frequent urinary tract infection, family history of kidney affections etc. Urine on the other hand is much more useful diagnostically as compared to GFR as it is the end product that is formed and it passes out of the body. The color, odour, pH, turbidity and volume of urine gives us lot of information about the underlying disease. For e.g. dark orange to brown colored urine is seen in case of jaundice, sweet smelling urine is seen in diabetic patients, increased quantity of urine production known as polyuria can be due to uncontrolled diabetes mellitus, adrenal cortical tumor etc. Apart from its use for medicinal purposes, urine is useful in other fields like agriculture, production of gunpowder, tanning of leather etc. 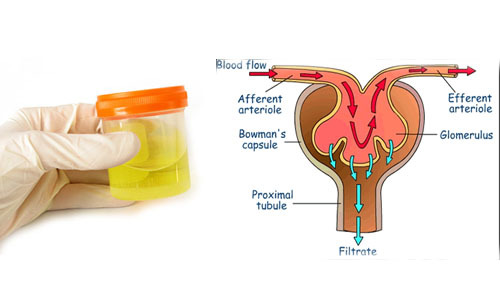 Urine and glomerular filtrate both help assessing the health of kidneys. Glomerular filtrate is formed in the process of urine production and it is limited to the Bowman’s capsule so it helps in assessing only a particular part of the kidney whereas urine is formed when it passess through kidneys, bladder, ureter and urethra and hence is helpful in diagnosing conditions affecting kidney as well as the remainder of the urinary tract. rachita. "Difference Between Urine and Filtrate." DifferenceBetween.net. December 28, 2014 < http://www.differencebetween.net/science/difference-between-urine-and-filtrate/ >.